Trump Passive-Aggressive Offer to Meet Iranians Rebuffed b/c he is "Unreliable"
At a news conference Monday with the prime minister of Italy, Trump blurted out that he was willing to meet with Iranian president Hassan Rouhani any time and without preconditions. That last remark seemed to be Trump’s way of teasing Iran about the economic difficulties he put the country in by violating the 2015 nuclear deal (Joint Comprehensive Plan of Action or JCPOA) and pushing for severe new sanctions on the country. The UN International Atomic Energy Agency has repeatedly certified that Iran lived up to the terms of the deal, in which it gave up most of its enrichment program in return for sanctions relief. Iranians feel badly treated by Trump’s unilateral destruction of an international treaty and punishment of them after they gave up so much and abided by their commitments. Trump objected that after the JCPOA, “the Iranians think they can do whatever they want,” referring to the robust Iranian role in Iraq, Syria, Lebanon (and, Washington alleges without much proof), Yemen. The nuclear deal was narrow and treated only Iran’s civilian uranium enrichment program, which its critics believed could be dual-use, i.e., could lead to the production of a nuclear weapon. Numerous US and Israeli officials and institutions have admitted, however, that at no point had Iran made a decision to militarize its enrichment program, which produces fuel for the country’s three nuclear power plants. Trump seems to be repeating his routine with North Korea, where he started out making dire threats and scaring the public about military confrontation, and then abruptly folded and gave Kim Jong Un his long-sought star turn on the world stage as a peer of the US president without actually getting anything in return other than vague pronouncements. Qassemi said, however, that military confrontation between Iran and the US is out of the question, though Iran does stand ready to defend itself if attacked. The clerical regime in Iran has been for decades a weird center of erratic behavior and wild conspiracy theories. But nowadays its spokesmen sound like the adults in the room compared to Trump’s antics (Trump has no idea what exactly as in the Iran nuclear deal or whether Iran honored it– he just had to undo it because it was an achievement of Obama). So congratulations, America, you’ve out-crazied the mullahcracy, which thinks you’re too ca-razy to bother talking to. Featured Photo: AFP/File / Nicholas Kamm, HO. 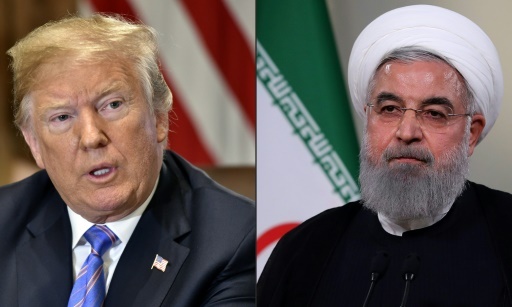 An advisor to President Hassan Rouhani (R) says any talks with the US must include a return to the nuclear deal which President Donald Trump pulled out of.